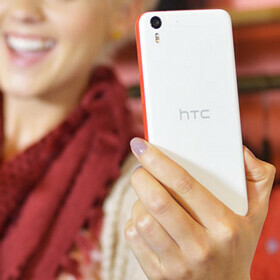 Launched by HTC in November last year, the Desire EYE has a near-flagship status. Even so, unlike the One (M7) and One (M8), the EYE hasn't been updated to Android Lollipop. However, the handset should get the new version of Google's OS sometime soon. While HTC has yet to provide official details on the Lollipop update for the Desire EYE, HTC ROM developer LlabTooFeR says that the smartphone will be skipping the Lollipop 5.0.1 update, going directly to Android Lollipop 5.0.2. Sure enough, that's not a big change, but 5.0.2 should be better (even if not noticeably) than the 5.0.1 release anyway. It's not clear if the 5.0.2 Lollipop update will also include the brand new Sense 7 UI (which debuted on the One M9), but we're hoping to find out more about this soon. The HTC Desire EYE is the world's first smartphone to have two 13 MP cameras (one on the front, and one on the back), both with dual LED flashes. The handset also features BoomSound speakers, a 5.2-inch display with 1080 x 1920 pixels, a Snapdragon 801 processor, 2 GB of RAM, and 16 GB of expandable storage space. You should read our HTC Desire EYE review for a closer look at the device. I was just thinking that. It looks a lot better than the m8. I might have to sell off my unlocked m8 and get the EYE instead. same here... But at least the M8 has duo camera feature which I enjoy a lot. Other than that, The Desire EYE is better to me. It's a truly great phone and I was was to choose it over M8..yet again camera wasn't good enough. I just bought the Desire Eye the other day and my life has never been complete till I got it.. It's extremely awesome I cannot. i liked the led on front cam,want this too. Have this phone and the front cam is great. If youre a selfie Lord better get one now.